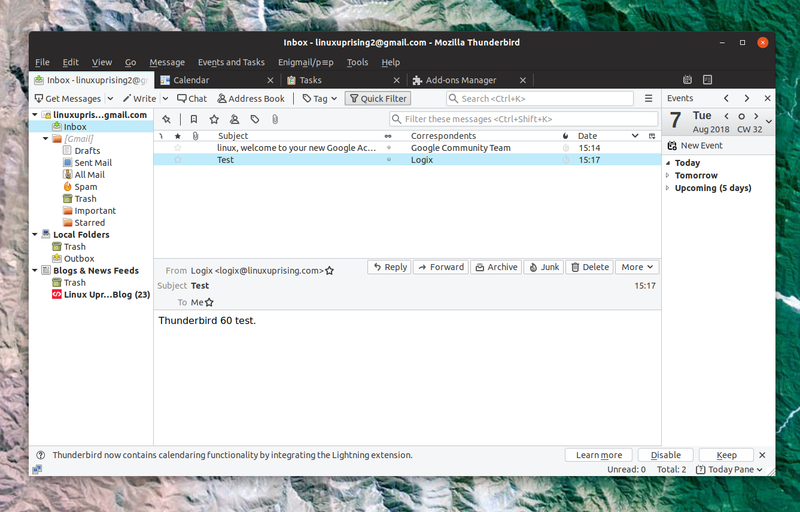 After more than one year since the previous major stable release (52.0), Mozilla Thunderbird 60.0 was released with some important changes, including a new Firefox-like "Photon" look, new logo, and attachment management improvements, among others. The free and open source email, news, RSS and chat client Thunderbird version 60.0 includes a Firefox-like Photon look, in which the tabs are square (and other theme improvements), along with new light and dark themes. 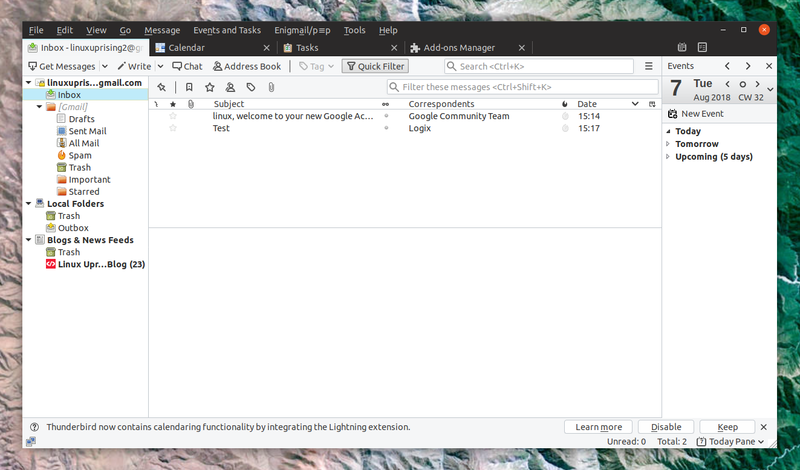 WebExtension themes are enabled in Thunderbird with version 60, and you'll also find multiple chat themes. Also, the native Linux notifications have been re-enabled with this release. I don't exactly understand what the point of the dark theme since the panes are not themed, but maybe it will be improved. 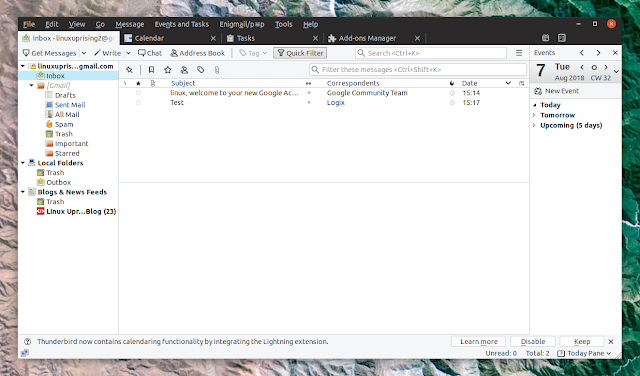 The new light and dark themes can be enabled from the Thunderbird Add-ons Manager (Tools > Add-ons). I should also mention that the new light theme has a small menu issue on Linux (the menu header text becomes very light gray on white background when a menu is activated) with some Gtk themes like Yaru (previously Communitheme), Canta, and probably others. There's an updated Thunderbird logo as well with this release, which you can see in the About Mozilla Thunderbird dialog above. Attachment management was improved with this release. The Attach button was moved to the right side of the compose window, and pressing Alt + M toggles the attachment panel. Also, attachments can now be re-ordered using drag and drop, a dialog, or keyboard shortcuts. To help prevent attaching the wrong files, when hiding a non-empty attachment pane Thunderbird shows a placeholder paperclip to indicate the presence of attachments. Thunderbird now allows the conversion of folders from mbox to maildir format and vice versa. This is an experimental feature that needs to be enabled by setting the preference mail.store_conversion_enabled. Note that this functionality does not not work if the option Allow Windows Search/Spotlight to search messages is selected. 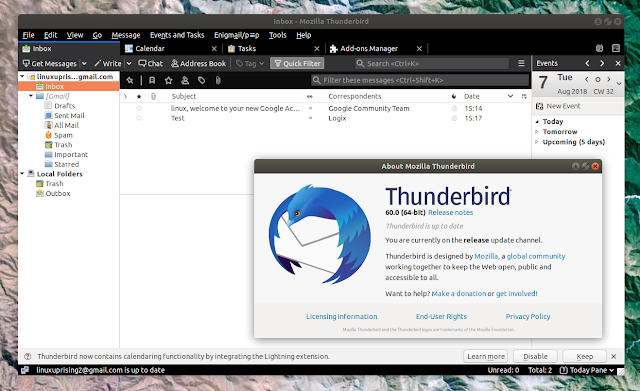 The complete Thunderbird 60.0 release notes can be found here. 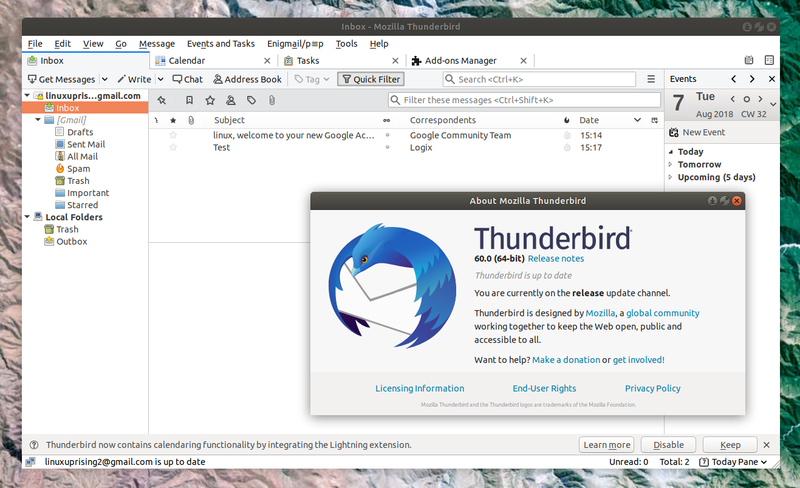 To install Thunderbird 60.0 on Linux, check if it was updated in your Linux distro repositories. If it wasn't, you can download the binary from the link above, extract the archive, and run the thunderbird executable. Mozilla Thunderbird is available on FlatHub, but it hasn't been updated to version 60.0 yet.